I’ll be sharing my first Five For Friday items today! I apologize for the late post – it was a busy day. It’s a beauty edition and I’ll be listing and discussing my top five beauty must-haves! Lip Balm – I am quite addicted to my chap stick and lip balms! If my lips are dry and I’m aware of it, it’ll drive me to distraction. I almost compulsively put on chap stick any time my lips loose that smooth feeling. My traditional go to ones are the Chap Stick Moisturizer original. More recently I’ve also been using Burt’s Bees which are a bit more expensive, but also really nice with flavors that are fruity, yet natural. I’ve noticed that the Chap Stick seems to last a little be longer than Burt’s Bees, but they’ve both been awesome at keeping my lips moisturized. Lotion or Moisturizing Body Cream – I am currently favoring L’occitane Fortune 8 Hand creams (30 ml tubes sold as a set of 8 with four original hand creams and 4 floral scents). I always carry lotion wherever I go, especially in the wintertime because my hands get dried, chapped and split easily. For overall body lotion, I personally prefer Jergens because it isn’t too thick, and doesn’t leave any oily residue. I also use glycerin or baby oil in the winter since my skin is more sensitive to the weather. My favorite scent in lotions is Berlye Taga’s “White Pearl Sakura Goat Milk Moisture Body Milk Lotion.” I use this one sparingly for it’s scent, because I don’t feel like it really quite moisturizes much. Sunscreen – I live in sunny SoCal where the perpetual sunshine provides a lovely tan but also increases the risk of skin cancer and spotting of the skin. I don’t care where I get the sunscreen, I have to have it for my arms, legs and face and neck no matter what the weather is. Any face products I use, like moisturizer (tinted or untinted), BB cream, all have to have sunscreen as part of the package. My go-to sunscreen is Neutrogena Ultra Sheer Dry-Touch Sunscreen in SPF 70 or 55. It is lightweight, doesn’t make my face oily, and doesn’t have any lingering fragrance. Mascara – I’m lucky that I can get away with just using mascara to make my eyes pop and on a busy morning, if I don’t have enough time to apply a full face of makeup – mascara does the trick to make me look more alert and awake. I don’t have any that I really like, because I feel like all mascara’s work pretty well, but I’d love to hear your opinions about it. Facial cleanser/make-up remover – This really helps you maintain healthy skin. Depending on your skin type, you’ll need to do some research to find your best match in cleanser. For some of my friends, a generic drugstore cleanser works wonders, but for others, they need a specialty cleanser. For those of you whom wear make-up a lot, a good make-up remover is a necessity, as any residue left on your skin can cause a breakout. I use an exfoliating cleanser at night to rub away any dead skin, and a gentle cream cleanser in the morning to wash out any oils I may have accumulated on my face through the natural process or via transfer from my hair to pillow. What are your top 5 beauty must-haves? Comment below and have an awesome weekend! If you enjoyed this content and would like to see more, don’t forget to subscribe! You probably wonder why I call you, my audience, “Wonderlanders”. Well, I’ll admit it’s a bit of a mouthful to say, and maybe not all that original. My blog and site is called “Allys in Wonderland” and I wanted to emphasize a philosophy of “looking at the world through eyes of wonder” for myself, and since you are reading my blog, I interpret it as you are taking a journey alongside me and living in our world of wonder. Yes, I know, that sentence was even worse with the number of times wonder and its variations show up. I apologize. While I want to write uplifting things and convey it in the things I present and share, it does not always match my current frame of mind. This week has been a bit rough. I’m back at home for the holidays and my mom and I have been incessantly arguing on and off over family matters and my brother and my concerns over her and her health and triggers for me are going off left and right. What’s helped to keep me sane is writing and thinking of what I want to write for you guys and also obsessing over planners. More about planners will be coming soon. I want to reiterate my appreciation for you taking the time to stop and peruse my blog. It gives me motivation to keep on going and to write even when I’m super tired. Back in October, I spent almost $400 on new beauty products because I had been using the same make-up brushes and set since sophomore year of high school. Talk about a health hazard! It wasn’t on that many items, mainly more expensive items that I decided to invest my money into in hopes that I wouldn’t have horrendous breakouts or a badly pigmented face. I figured if it was something that helped me with my “loving me more” goal, I should really learn to use the stuff I bought, so I did a Make-Up week Challenge with my friend Vicky. Needless to say, we survived most of it…we may have skipped a day or two… But I’ll be sharing some of those stories in future posts. I’m on a bit of an unintentional beauty streak this week. I actually didn’t realize it until early this morning that my posts so far this week have all been beauty related. I’ll keep this streak for the week, and while I can’t guarantee it won’t happen again, I hope you enjoy it and all the random bits of madness I’m sharing. Growing up in a predominantly white and Hispanic/Latino community as one of the only Asians, who also happened to be awkward and nerdy, I didn’t have many role models of the same ethnicity to look up to. I didn’t really watch TV or surf the Internet growing up because my parents restricted my time with electronics until the end of middle school. Whenever I could sneak onto the Internet, I would look up fanfictions and check my secret MySpace account, and look for more “emo” music to listen to. One of my only Asian friends at that time, Jennifer (who to this day remains my long-standing Asian/Tawianese Best Friend from Childhood), introduced me to a few YouTube artists and among them was a girl from the United Kingdom who used the name Bubbiosity for her videos. I remember the first video I watched of hers was “Let’s Get Wasted!” (http://youtu.be/2tyOrf0yGLs) which was both hilarious and somewhat truthful. She made fun, uplifting videos and was never scared to put herself down while on camera. Over time, her content has changed a little and become much more focused. However, she never lost her theme of trying to make other smile and happy. Lindy is the girl behind the videos. She is successful, and genuine and it makes me want to be her. She got married over a year ago, has been a proud mom of two furbabies and is now a proud mother to her darling Peanut. She has her own clothing and make-up brush line and is still very active on YouTube. So active in fact, that she’s created multiple channels (BubzBeauty, & BubzVolgz) to handle all the different stuff she does. If you have time, check out her awesome beauty tutorials on YouTube at BubzBeauty. Hats off to this inspiring lady who has been uplifting spirits around the world. As Bubz would say, “It’s a bubbiful life!” Watching her videos gave me confidence in my own nerdiness and inspired me to be proud of my heritage instead of being ashamed and hiding it. This has been a big step in me becoming me. As always, feel free to comment, ask questions, or critique below and I’ll get back to you as soon as I can. If you have time, answer a question for me – Who was your role model growing up? Who first gave you the confidence to be you? If you liked this post and would enjoy similar content in the future, feel free to subscribe! I will not send spam, and you’ll only receive notifications of when I post. For the longest time, I wasn’t interested in beauty products beyond every day hygiene necessities. Then I hit a phase in my life where I wanted self-improvement, and to me, it meant the whole package, mental and physical. I started paying more attention to the way I was presenting myself, and that lead to my dabbling in makeup and beauty products and a perm. In my quest for more knowledge, I started to read blogs about beauty and a good lifestyle in general and I stumbled on Kayla Aimee’s blog – Kayla Aimee Writes. She’s so darn humorous and down to earth and full of goodness, but that’s for another day. One of the things she had discussed and reviewed was a subscription service called Birchbox. I was intrigued. What was this magical subscription for only $10 a month? Well, it features 5 personalized beauty samples a month for you for only $10 with free shipping. There are two subscription boxes – men’s and women’s. You can get one for yourself, and one for your sibling or significant other and enjoy the goodies together! When you join the subscription, you can either pay $10 a month, or $110 for a whole year. For women, you create a profile by answering a survey about what beauty looks you like, what skin type and hair type you have as well as some other ones that I don’t remember off the top of my head. I’m sure that the men’s section has a similar survey too. 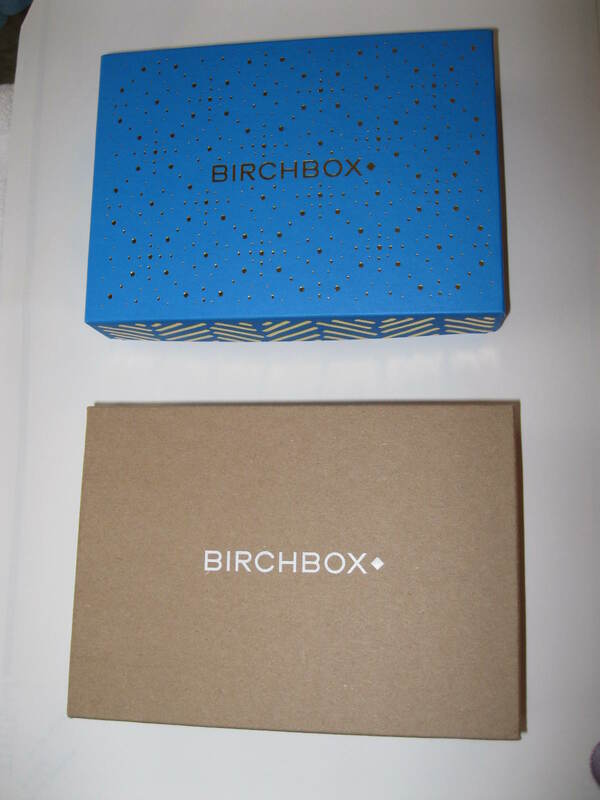 This is how Birchbox customizes the subscription box for you. I’m a college student on the college student budget and $10 for beauty product samples that I’d normally never try or even heard off really isn’t bad. So far, I’ve received two boxes, November and December, and I’ve really liked the products I received. I will post up about them later separately so I don’t overwhelm you guys as I am still playing catch-up to my weekday prompts. I do plan on posting a monthly review of my Birchbox samples starting in January. You may ask me how can I review something that I’ve only had for 2 months, but let me tell you, I know straight off when I have a physical item with me whether I will like it or hate it. I liked the Birchbox subscription in case you can’t tell. Yes, there were some items that I don’t need. Or wouldn’t use normally for that matter, but it was still nice to be given a chance to try it out. Plus, by reviewing the items you’ve received, you could earn up to 50 Birchbox points (their reward system) which equals $5 to spend in their shop. Birchbox has full sized products of the samples you receive and more in their shop, and more ways to earn points on their site. I will be providing my referral link below – I earn 50 points anytime someone purchases their Birchbox subscription. Please feel free to look through the site and see other blog posts across the web for reviews of their products and customer service. So far I haven’t heard or read anything about bad customer service with Birchbox, but if anything changes, I’ll be sure to let you know. I am not paid or given extra benefits by Birchbox for providing this review of their service. All opinions stated are solely my own and I am imply sharing my opinion of the things I’ve used or come across that I find useful or not useful. What you decide to do with the products in my review or opinions is not my responsibility. As always, I would love to hear your feedback – questions, comments, and concerns, so comment below and I will respond as soon as I can! I do sincerely apologize for the delay in this post. I did warn you that I’d be bad at getting things started and sticking to it, but at least I’m getting this post up! Today, I wanted to share with you a kit that I enjoyed using for fine nail art. Usually when I do my nails, I stick to easy things like one basic color. This is a throwback to June 2013 when I was taking summer classes with my friend Crystale and we were bored. 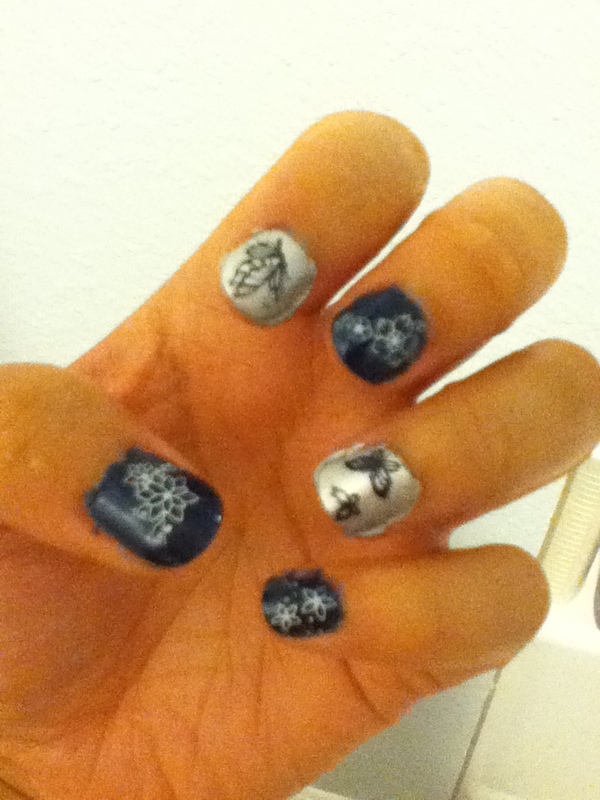 She told me about this nail stamping kit that she had invested in to do her nails with and I wanted to try it. We ended up at her parent’s home and having a manicure party which resulted in the pictures below. My right hand. 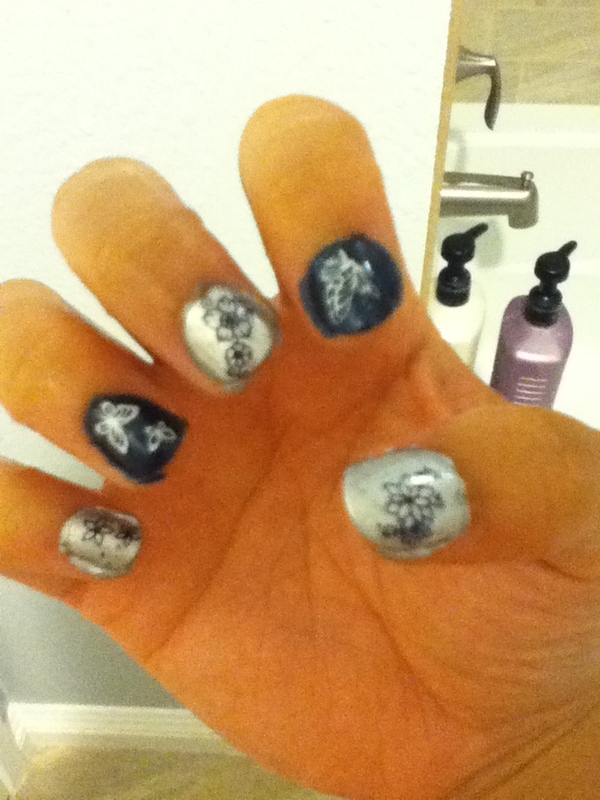 Butterflies and flowers design in silver and deep blue. I have a really hard time making decisions regarding myself. So I drove Crystale nuts with my indecision on what colors I wanted. It then turned into whether I should do blue or silver, and her mom cut in, suggesting I just did both. That suggestion was definitely worth it. I love cool colors and the metallic silver just really complimented the coloring as well. The first shot of my left hand – notice the fine lines of the stamping on both the butterfly and flowers. I do apologize for the crappy photos – they were taken on my iTouch 4th generation which doesn’t have a great camera. I think that the detailed art of the stamps are still visible though. My left hand has the reverse color motif of my right hand. ✻ Paint the nail with your base coat, then your base color. Allow each to dry completely before layers. ✻ Select stamp image and color from selection. Paint the image selected on the image plate. ✻ Scrape off excess paint, then use the rubber stamper and gently roll it over the painted image from the plate. ✻ Align with nail and gently but firmly roll the rubber stamper across the nail. Image should transfer without smudging if you do it fast enough. ✻ Wait for stamp image to dry before applying top coat. Be deliberate with the top coat as sustained movements may cause stamp image to smear. ✻ Admire nails. Repeat from the third step on as many fingers and toes as you’d like! 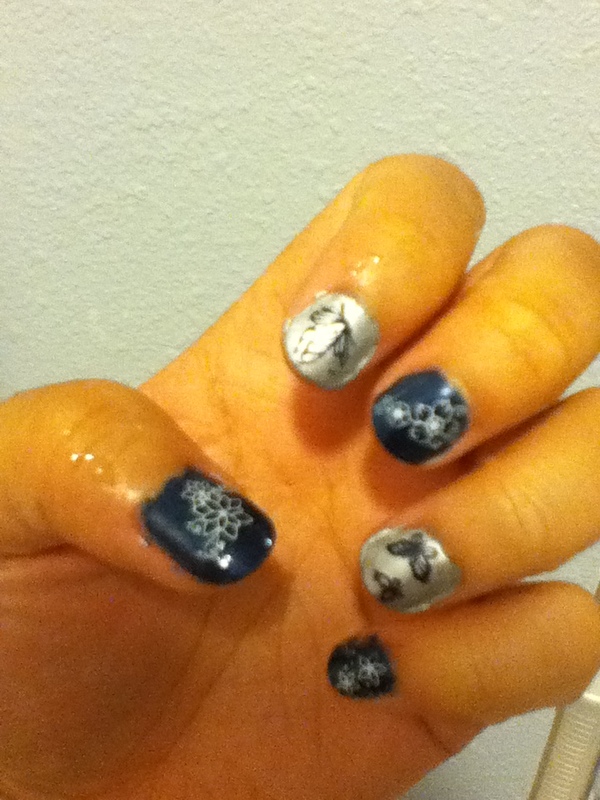 It was a little tedious getting the nails done, but they turned out so well with patience. I found a link with a tutorial directly from Konad (don’t mind the calypso-esque music and slow talking), it shows what I described above so much better. If you liked this post and would enjoy similar content in the future, feel free to subscribe! I will not send spam, and you’ll only receive notifications of when I post. As always, I would love to hear your feedback – questions, comments, and concerns, so comment below and I will respond as soon as I can! I am not a pro at manicures, nor do I get paid to endorse a product. I am simply sharing my opinion of the things I’ve used or come across that I find useful or not useful. What you decide to do with the products in my review or opinions is not my responsibility.